Interested in how response rates can be improved or how faculty can use formative feedback to drive reflective teaching? Check out the Explorance blog. Having trouble finding your SFQ QP or Response Rate invitation in your Humber email? Search all of your mailboxes for an email from sfq@humber.bluera.com or an email with the subject line that includes Humber Student Feedback Questionnaire. Log in to your spam.humber.ca account and whitelist emails from sfq@humber.bluera.com. You can search for these emails in your spam environment. Release them all and whitelist them. Using the Focused tab feature built into the Office 365 Outlook mailbox, especially on your phone? Search through the other inbox as very often the sfq@humber.bluera.com are being captured by the Other folder/tab. When do I add my Personalized Questions (or QP)? 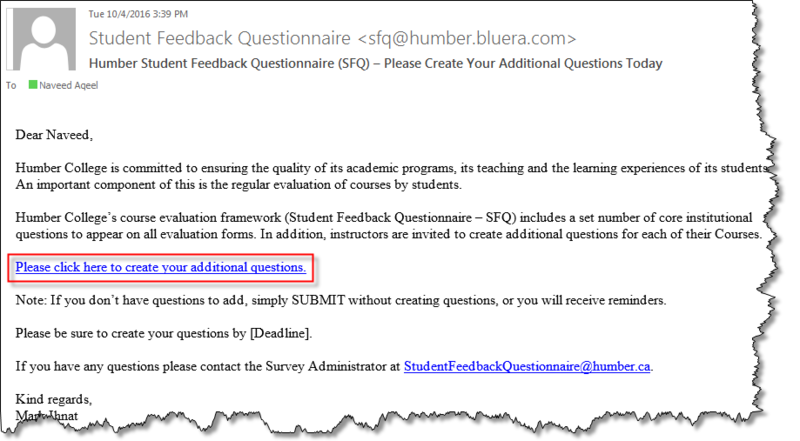 Faculty will receive an email directly in their Humber email inbox encouraging them to create their personal questions, approximately 5-7 days before the SFQ is made available to students. Humber College is committed to ensuring the quality of its academic programs, its teaching and the learning experiences of its students. An important component of this is the regular evaluation of courses by students. 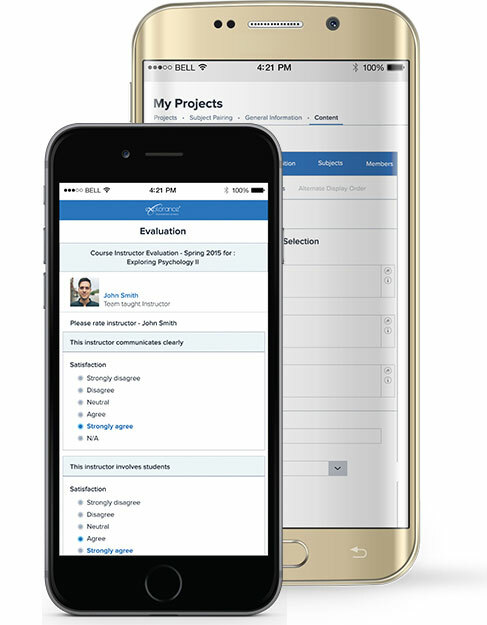 Humber College’s course evaluation framework (Student Feedback Questionnaire – SFQ) includes a set number of core institutional questions to appear on all evaluation forms. In addition, instructors are invited to create up to three additional questions for each of their courses. 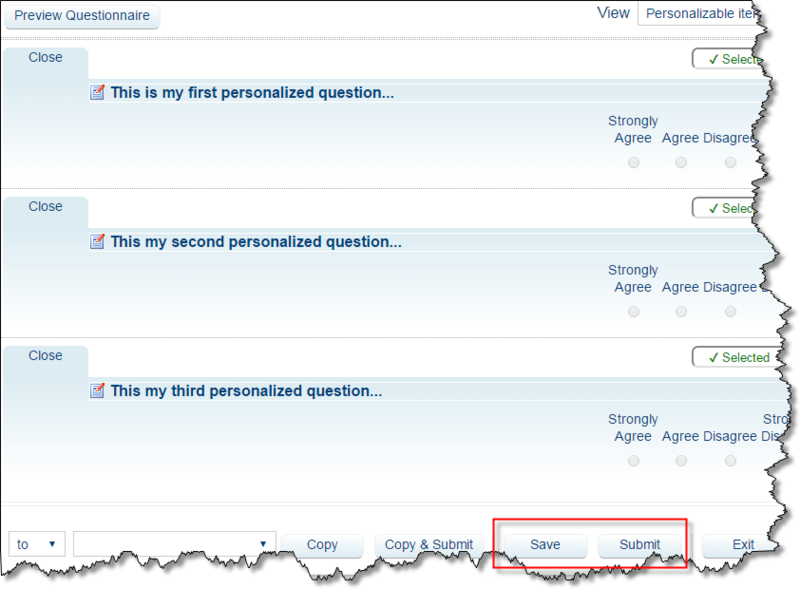 Please click here to create up to three additional personalized questions. Note: If you don’t have questions to add, simply SUBMIT without creating questions, or you will receive additional email reminders. 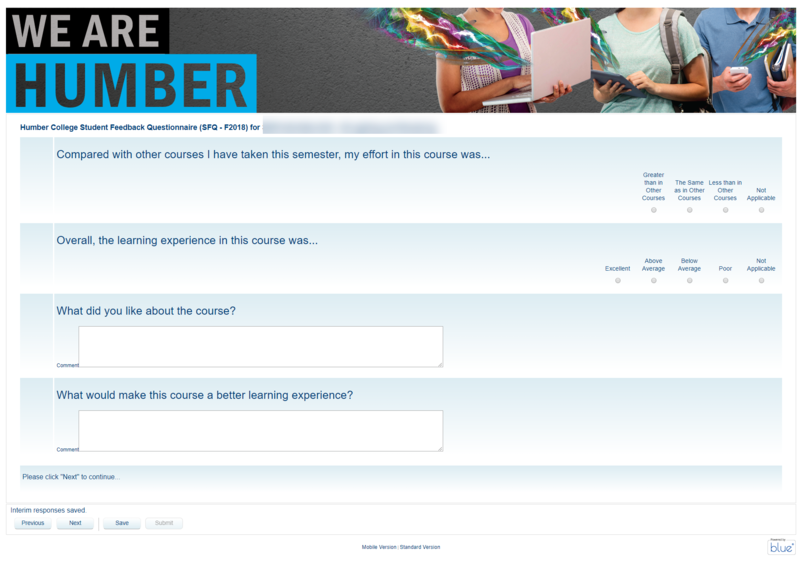 If you have any questions please contact the Survey Administrator at StudentFeedbackQuestionnaire@humber.ca. Toggle between the following three buttons to view the information for each topic. 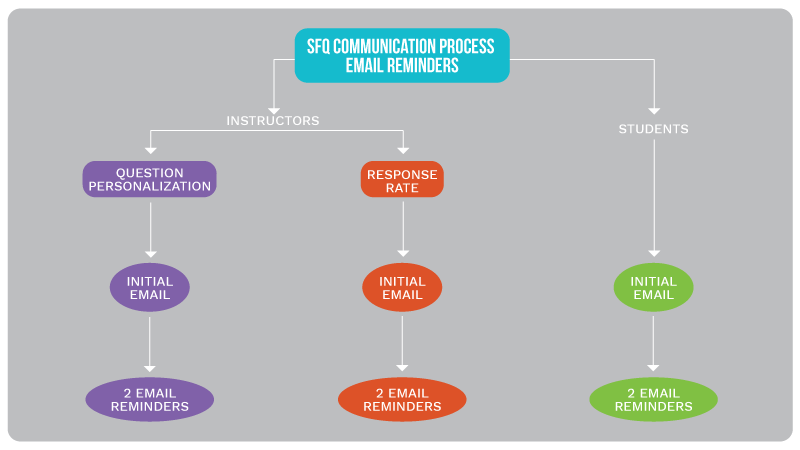 You can enable the SFQ tool for your students through your Blackboard course(s) in addition to the automated email message students will receive past after the question personolization due date. Log in to your Blackboard course. Task Type: You will choose the course link beside Question Personalization to add questions. End Date: This is the due date to add personalized questions to the SFQ by. The link will open up an Internet browser page on your computer with the list of all courses you are teaching for the current term. Click on the course link where you wish to add peronalized questions into and follow steps 8 to 11 from Method 1 to add peronalized questions to the survey. What does the SFQ look like from the student perspective when launched? What questions are included in the SFQ for face-to-face courses? The professor presented his/her materials in a clear manner. The pace the professor set for the course was appropriate for me. The professor helped me think critically about the topics in the course. The professor treated me with courtesy. The professor provided clear explanation about how student work would be evaluated in the course. The way the professor taught helped me learn. The professor provided me with useful feedback about my progress. The professor managed student classroom behaviour. The professor motivated me to learn. The professor responded to my course-related voice message(s) or email message(s) within 2 school days. The professor returned assignments and tests within a 2-week period. YOUR PROFESSOR’S QUESTIONS. Answer any additional questions provided by your professor using bubbles 16-18. Your comments are highly valued and will assist the professor with this course. What would make this course a better learning experience? What questions are included in the SFQ for online courses? My course site was up to date and ready as of the start of the semester. The learning materials were presented in a clear manner. My course site was well organized and easy to navigate. The learning activities (e.g. assignments, discussions etc.) helped me think critically about the topics in the course. A variety of teaching methods (e.g. group work, multi-media, case studies, web links, etc) were used in the course. There were opportunities for me to actively participate in the course as a learning partner. The pace the professor set for completing the course was appropriate for me. The professor appropriately managed student behaviour/interaction within the course site. The professor responded to me with a courteous tone and professionalism. The professor provided clear direction about how student work would be evaluated. The professor interacted with me and contributed to the experience in a manner that helped me learn. The professor responded to my course-related questions within 24 – 48 hours (except on weekends). Other comments you would like to share with your professor. I have questions about the process, who do I ask? For questions regarding personalizing your SFQ, analyzing your results, or for questions on how to integrate your feedback into practice, please contact Carol Appleby at Carol.Appleby@humber.ca. 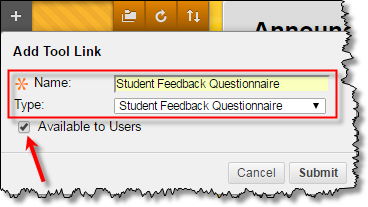 For questions regarding the enabling of the Digital SFQ in Blackboard, the overall step-by-step process and additional technical support, please contact Mark Ihnat at Mark.Ihnat@humber.ca. How do I know if my response rate is “good”? The expectation at Humber College is that our SFQ response rates reach 70%. Faculty are expected to track their digital SFQ response rates and encourage their students to let their voices be heard by filling out the SFQ. See the sample “Review Your Response Rates Now” email below. This email will be sent to faculty once their SFQs have gone live. Instructors are invited to view their SFQ response rates. Please click here to view response rates. I am conducting a face-to-face course, how do I deploy a Digital SFQ? We recommend that you take some time in your class to explain the process and the importance of SFQs and use class time to deploy the SFQ to your students. To ensure students participate in the SFQ, we recommend that you ask your students to pull out their devices and then spend 15 minutes of class time to complete the SFQ. We also strongly encourage you to enable the SFQ in your Blackboard course site. 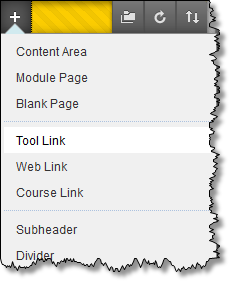 The SFQ tool will be enabled, but hidden, by default in the Humber Blackboard Template. We encourage you to show (unhide) the SFQ tool in your Blackboard site. If the tool is not available in your Blackboard site, you can very easily and quickly add the tool to your Blackboard menu structure. Please visit the Tech Support page for instructions. Reports will be made available to faculty via a unique URL after the close of the term (after the course end date). I have added the SFQ tool to my Blackboard site but it doesn’t work! What have I done wrong? Nothing. The tool only works for students. 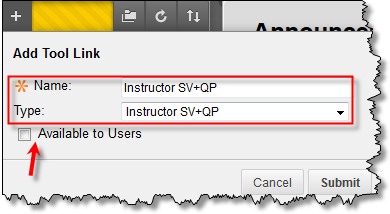 When an instructor clicks on the tool, they will receive a message indicating that the SFQ is not available. This means it is not available to instructors only. Students will still have access. Yes! Each faculty member has the opportunity to add three of their own Likert scale questions. You will receive an email indicating when to complete this task – this is voluntary. You typically have one week to complete the personalized questions. 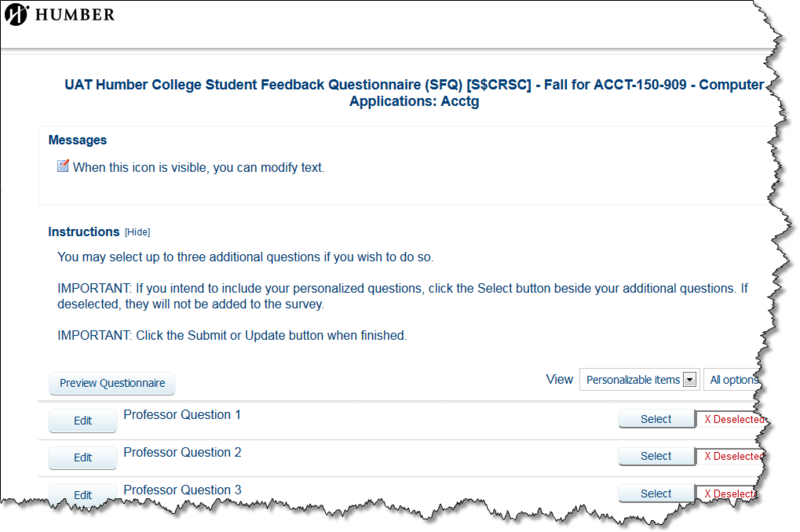 For more information regarding personalized questions, go to the Faculty Step-By-Step Tip Sheet for Digital SFQ. When do the SFQs get deployed? This all depends on the start and end date of your course. We have set rules that allow for the SFQ to be deployed at approximately the 65% mark/stage of your course. SFQs are available for students for up to 3 weeks depending on the course. If you want a more specific date range, please see the Critical Dates. Once you get an email asking you to create personalized questions, this indicates that your SFQ is only a week away from deployment. While the SFQ process is running, faculty are not able to see their results. However, faculty will get reminders to view their response rates. With this information, faculty can ramp up or tone down their manual reminders to students to fill out the SFQ. Faculty can anticipate receiving notification that their results are available during the third week of the following semester. Faculty will receive an email with a unique URL where they can view their final reports. See below for a sample of the email that you will receive after the end of the semester. How is the SFQ deployed? Students will get numerous emails reminding them to fill out the SFQ by clicking a personalized URL. 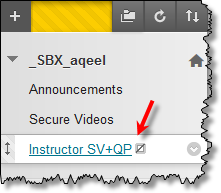 In addition, faculty are required to add the SFQ tool to their Blackboard sites. Go to http://www.humber.ca/bb91help/instructors/sfq.php to view the help file on how to “Enable the SFQ Tool in Blackboard”. 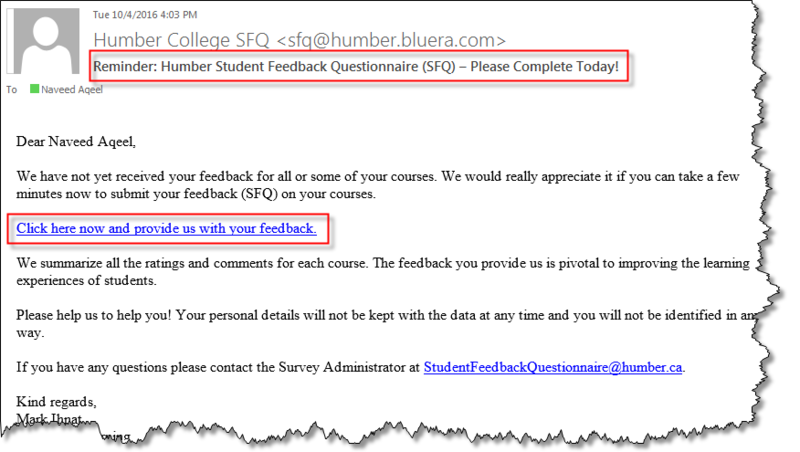 Every student at Humber College, receives an SFQ – it’s an opportunity to get/give feedback on the overall learning experience. All student responses are anonymous and confidential. Who is included in the Digital SFQ? As of fall 2018, all courses and programs (face-to-face, hybrid and online courses) will be receiving their Student Feedback Questionnaire in a digital format. 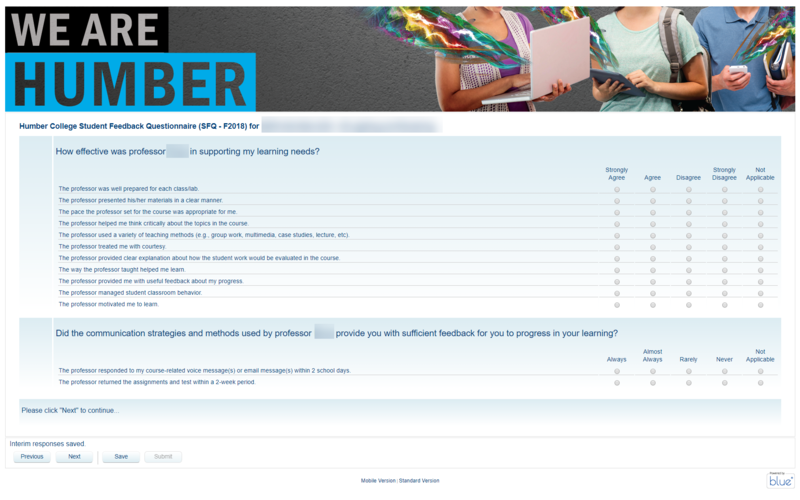 Humber College (except for the University of Guelph-Humber) no longer uses paper-based forms to collect formal, end of semester, student feedback.